As a result, Blind Spot Assist may not give warnings in such situations. There is a risk of an accident. Always observe the traffic conditions carefully, and maintain a safe lateral distance. Blind Spot Assist is only an aid. It may fail to detect some vehicles and is no substitute for attentive driving. In particular, the detection of obstacles can be impaired if there is: • dirt on the sensors or anything else covering the sensors. • visibility is poor, e.g. due to fog, heavy rain or snow. 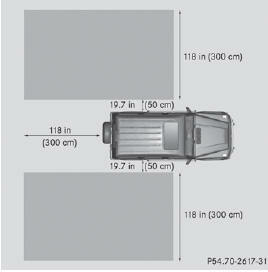 • there is a narrow vehicle traveling in front, e.g. a motorcycle or bicycle. • the road has very wide lanes. • the road has narrow lanes. • you are not driving in the middle of the lane. • there are barriers or other road boundaries. 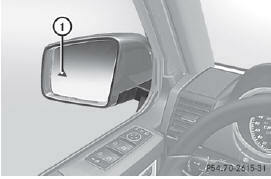 Blind Spot Assist uses a radar sensor system to monitor both the left and right sides of your vehicle. It supports you from a speed of approximately 20 mph (30 km/h). 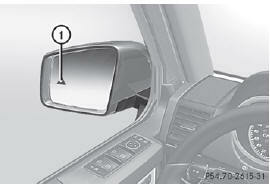 A warning display in the exterior mirrors draws your attention to vehicles detected in the monitored area. If you then switch on the corresponding turn signal to change lane, you will also receive an optical and audible collision warning. For this purpose, Blind Spot Assist uses sensors in the rear bumper. Blind Spot Assist monitors the area up to 10 ft (3 m) behind your vehicle and directly next to your vehicle, as shown in the diagram. If the lanes are narrow, vehicles driving in the lane beyond the lane next to your vehicle may be indicated, especially if the vehicles are not driving in the middle of their lane. This may be the case if the vehicles are driving on the inner side of their lane. Due to the nature of the system: • warnings may be issued in error when driving close to crash barriers or similar solid lane borders. • the warning is canceled when driving for an extended period next to long vehicles, such as trucks. The two sensors for Blind Spot Assist are integrated into the sides of the rear bumper. Make sure that the bumper is free from dirt, ice or slush around the sensors. The rear sensors must not be covered, for example by bicycle racks or overhanging loads. Following a severe impact or in the event of damage to the bumpers, have the function of the radar sensors checked at a qualified specialist workshop. Blind Spot Assist may otherwise not work properly. When Active Blind Spot Assist is activated, indicator lamp 1 in the exterior mirrors lights up yellow at speeds of up to 20 mph(30 km/h). At speeds above 20 mph (30 km/h) the indicator lamp goes out and Blind Spot Assist is operational. If a vehicle is detected within the monitoring range of Blind Spot Assist at speeds above 20 mph (30 km/h), warning lamp 1 on the corresponding side lights up red. This warning is always emitted when a vehicle enters the blind spot monitoring range from behind or from the side. When you overtake a vehicle, the warning only occurs if the difference in speed is less than 7 mph (12 km/h). The yellow indicator lamp goes out if reverse gear is engaged. In this event, Blind Spot Assist is no longer active. The brightness of the indicator/warning lamps is adjusted automatically according to the ambient light. If a vehicle is detected in the monitoring range of Blind Spot Assist and you switch on the corresponding turn signal, a double warning tone sounds. Red warning lamp 1 flashes. If the turn signal remains on, vehicles detected are indicated by the flashing of red warning lamp 1. There are no further warning tones. ► Make sure that Blind Spot Assist is activated in the on-board computer . Warning lamps 1 in the exterior mirrors light up red for approximately 1.5 seconds and then turn yellow.